Morecambe have made former Accrington winger Lee Molyneux their second summer signing. The 26-year-old arrives at the Globe Arena on a two-year deal after his short-term contract with relegated Tranmere Rovers expired. Shrimps boss Jim Bentley had previously admitted he wanted to sign Molyneux in the January transfer window only for finances to get in the way but he has now got his man. Bentley is looking for six new faces to bolster his squad and just 10 days removed from the end of the League 2 season already has Molyneux and former Blackpool wide man Tom Barkhuizen in place. Huyton-born Molyneux, a former Everton youngster, left Stanley for Crewe in the summer of 2013 after a breakout season in League 2 but has seen first-team opportunities at Gresty Road limited. 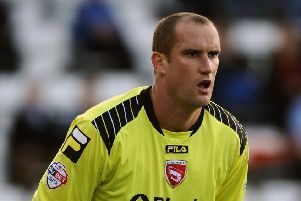 He spent time on loan at Rochdale and back at Accrington before being allowed to join Tranmere in January. After failing to break into the Everton first team as a youngster Molyneux also had spells at Southampton and Plymouth earlier in his career. He will wear the number 10 shirt at the Globe Arena.